Life with a puppy, while it seems intense at the time, is actually a honeymoon compared to living with an adolescent dog. And it isn’t just your dog, it is all adolescent dogs, a little or a lot, that tend to bring out the worst in their human. There are specific reasons why, and the more you learn about this, the more you will understand, and the better you can do! If you have human adolescent children, your going to see a bunch of similarities, which can either be funny, or a giant warning sign. On a side note, I love this developmental phase, love it with a capital L.O.V.E. It’s a time of high energy, opinions, scampiness, testing, freedom seeking, and power. Your adolescent dog is bringing it all to the table, no hidden secrets, good , bad, or indifferent. Raw honesty. Everything feels acutely alive, and with this new amplification in personality and physical power comes specific obligations for the handler. A WORK IN PROGRESS – The adolescent brain is not a finished product but rather a work in progress. Major changes in the brain, like self control, judgement, and emotions happen between adolescents and adulthood. So it is safe to say, if you give your adolescent dog adult privileges, or adult responsibilities, they will fail each and every time. It isn’t because they are being defiant, or stubborn, or manipulative, it’s because they can’t. Their brain, much like or human child brain during adolescents, is not equipped or developed enough to handle life with maturity. Life with an adolescent dog will include poor decision making, recklessness, and emotional outbursts. However it can also include amazing training opportunities, relationship building activities, and balance. EMOTIONAL HIJACKING – It’s all about arousal, and how you handle it. Daniel Goleman coined this term and it is so fitting for the adolescent dog as well as the handler of an adolescent dog. Emotional hijacking is when ones own emotions overwhelms their system to the point of heightened arousal and emotional stupidity. Adolescent dogs can go from 0-60mph emotionally and it takes a patient and balanced handler to teach them how to come back down to a more balanced place. Thoughts and emotions drive one another, the trick is keeping them both in balance, when emotions sky rocket, thoughtfulness goes out the window. Learning how to modulate your own emotions and arousal levels is super important, because there is no such thing as an aroused and emotionally hijacked handler being effective. So on both ends of the leash there needs to be balance. This means choosing environments carefully, and choosing activities that are fun and exciting, but not to the point of emotional hijacking. EXPOSURE – In order to create balance and an emotionally supple dog, the adolescent dogs needs exposure to new and different activities, within their skill level, all of the time. This is not the time to leave your dog in the yard because they are driving you nuts, or turn your dog lose at the dog park so other dogs can exercise them for you, but rather a time to investigate new activities that challenge the brain and the body. Expose, expose, expose. The more activities you do together to better emotional balance, concept solving, and reasoning on both ends of the leash. Agility, scent work, hiking, tricks, freestyle, rally, tracking, skiing, fetch, tug, hide n’ seek, visiting stores, and the list goes on. Training, teaching, learning, focusing, trying new and different is vital for the adolescent Team. PLAN – Have a plan for your dog each and every day that includes exercise (mental and physical), rest, socialization (that your dog enjoys not what you want them to enjoy), play with you, eating, and more rest. Notice that the day is planned out, there is nothing that screams ‘permissive free time’, and no kinda sorta maybes, and for sure not ‘run and be free, Ill catch ya when the wind blows’. A clear plan. FOCUS – It is easy to get distracted by what others say, or tell you about your dog. It is easy to get distracted when your dogs behavior goes to hell in a hand basket in less than a minute. It is easy to get distracted if your life gets busy outside of your dog, and you give up. So focus. Just focus. Don’t let distractions get in the way of your core relationship with your dog. Breathe, take a few full deep breaths, and then do something that will reconnect you and your young dog. If you allow emotional clutter to get between you and your adolescent dog, the gap will grow to the size of a deep canyon in no time at all, and will last for a long time if not forever. So focus and don’t allow distractions that distract you from your adolescent dog. Remember why you have your dog, the importance of your relationship, and the potential of your Team together. ALWAYS LOOK FOR THE GOOD – There is a place in our brain called the Reticular Activating System, simply put, where your focus goes, attention flows. For example, if you notice your dog doing something that you like, you will start seeing more of that behavior. Whatever you’re interested in, this part of your brain will find more of it. And it acts like a spring board most of the time, motivating adolescent dog handlers to do more, because they are seeing more of what they like! Conversely though, if you only focus on what your adolescent dog is not doing or doing poorly (jumping on people, jumping on the door, barking, lunging, etc) you will see more of that, and it can adversely affect your relationship with your dog, and be seriously demotivating. PLAY – Some adolescent dogs are tender, but most thrive on explosive and dynamic activities, and play can fill that bill. Play is a successful way to make mistakes, as it isn’t about right or wrong, it’s about the relationship in motion. There is freedom on both ends of the leash, expression of ones self, movement, and connection of two living beings. Play needs to be safe and fun, but keep in mind you still need to focus on emotional balance, don’t go into wingy heightened arousal where one of you becomes emotionally stupid, that is where bad decisions are born. FEELING SAFE – During the first year of a dogs life they go through two significant fear periods. The first one is around eight weeks of age, the second one (referred to as the second sub fear period) is a little fuzzy and can happen any time between 6-14 months of age. Some adolescent dogs have a minor hiccup and move on quickly, while other young dogs dissolve before your eyes. It is like an open window into their personality, their being, and during this time they cannot have stress above their skill level, or be put in situations that cause them a great deal of concern. You will know your dog has hit their second sub fear period as what was seemingly okay before now causes reactivity, or complete avoidance. So, write this down, put this on your refrigerator, ‘dogs can only learn if they feel safe’. While your adolescent dog may be pushing all of your buttons, you need to look beyond that and ask yourself if you have created a safe environment, so your young dog can hear you, see you, and respond to you. CONTROL – Disciplining an adolescent dog with physical force or emotional manipulation just doesn’t work, if anything it is counterproductive. Relationships are natural and kindness counts, and this is 100% true with our adolescent dogs. Control is merely an illusion with the adolescent dog. If your adolescent dog trusts you, and feels safe with you, there is an agreement, an opening. Working and building life skills with your young dog, at its core, is cooperation, not control. 12 years in the Paws & People classroom! Nicely done….easy to understand. There IS hope for an adolescent dog. Thank you so much for posting this! It came at the perfect time! My Deja, who just turned 15 months is beyond amazing in so many ways but she has also been very challenging these last several months! I am in love with every inch of her craziness but in the last few weeks I have let a few people plant doubt in my mind – not about her (that isn’t possible) but I have been feeling as though I completely failed as a puppy owner. I began to make a statement just last weekend about the stages dogs go through while growing up, not to make an excuse but to start a discussion and increase my own understanding about how my puppy is developing and I was stopped mid sentence and told “nowhere does it say at age 14 months can they stop obeying.” I was also told if I wanted her focus I needed to make her sleep in her crate and not in my bed. I love having her in my bed, right next to my face, so I can smell her and feel her! For the last week I’ve been going over that conversation and my own beliefs and your blogs and Facebook posts nonstop. Thank you for reminding me that I am not crazy, she is not a robot, and that maybe I will have to work a little harder at the outcomes I am looking for, but the extra work is well worth treating my dog as a family member and not a tool to gain my own accomplishments! Thank you for seeing the big picture and helping me stay on track! P.S I was never going to make her sleep in her kennel, but I was beginning to believe maybe we weren’t cut out for the level of training I would like to achieve, now I’m that much more motivated to prove to myself that we can! And I think the notion of obeying is just a bunch of hooey anyway. You are a brilliant trainer, you know your dogs, you train consistently, you train with cooperation, and you get amazing results, and the relationship you have with your dogs is enviable! 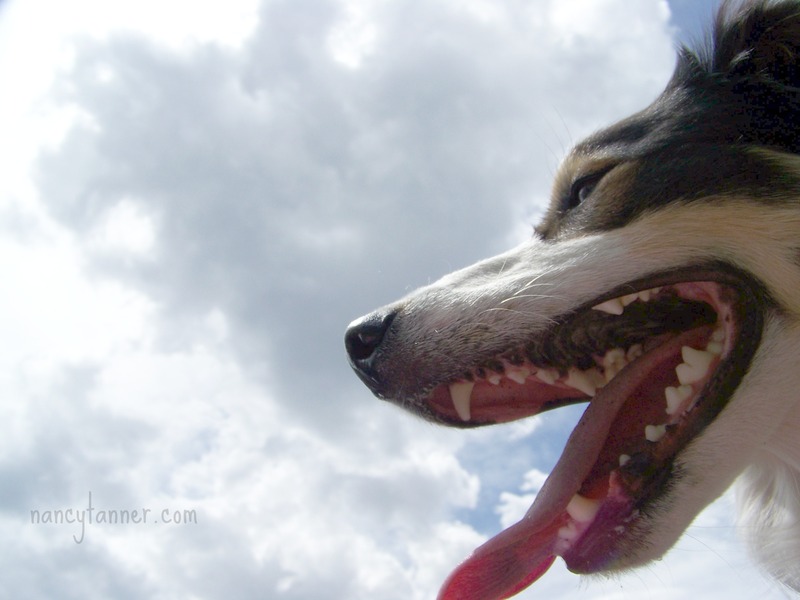 Thanks for this post–it is perfect timing for me and Ty (my 6+ month-old Border Collie). I was not your best student in Puppy III, but I did actually learn a lot, and believe your techniques are spot-on. Just today I got a bit frustrated when Ty was jumping and running around, and not performing the tasks he knows, and I know he knows! I came to your site to look for advice and found this post! Every point given here is important, but for me this morning FEELING SAFE and CONTROL were the top ones I needed to remember. When Ty does not obey, that is a sign that I need to work harder to help him understand. Thanks again! Ty and I will continue to work, play, experience new things, grow together, and make it through adolescence. Your 0-60 was a great description. And this article has helped me to see my new adopted rescue might just be in that “adolescent” zone, no matter what age. Because he has not had any (any) training. Thank you for the help. Now….how to turn 0-60 into 60 – 0! Will keep reading…..